"it's unlikely we'll see much return from all this"
Who knows? If a few young Brits get inspired in to engineering and later form businesses with £M turnovers it will have been worth it. Re: "it's unlikely we'll see much return from all this"
Following it via the various articles on the BBC and elsewhere, there's already a hell of a lot of inspiration coming to schools and industry from it. They're doing an excellent job of making it not just a "toys for the boys" enterprise, but one that's really engaging the public. Even down to the small things like being able to sponsor it, and get your name onto its tailfin. All in all top engineering and boffinry, pints all round (and a coke for Andy Green as the designated driver). "If a few young Brits get inspired in to engineering and later form businesses with £M turnovers it will have been worth it." ITYM "If a few young Brits get inspired in to engineering and later find out there are precious few jobs in the UK because private companies decided it was better to save a few pennies and offshore everything while successive governments didn't give a stuff about it except for how much they could get by selling off engineering related assets to whoever had the fattest wallet." Need an up to date example? Why is a new nuclear power plant going to be built by the Chinese? Has Osborne ever thought there might be the know how here to do at least some of it or is sucking up to some human rights abusers in order to be thrown some business scraps more important? Make up your own minds. Engineering jobs are there for the taking all over the UK. Manufacturing may have largely been outsourced, but a lot of the products pouring out of those offshore factories were designed here. And as wage demands continue to rise in traditional outsourcing locations such as China, bringing manufacturing back home is starting to look more attractive too. As to why we're getting someone else to build our new atomic kettle, maybe it has something to do with it being close to 3 decades since we started building the last one in the UK, so unless we've been running a very hush-hush project to continue building nuclear power plants and maintain our national experience in that field, I'm not really sure who you think we should have asked to build this one? I agree, it is bizarre that you are commissioning China to make a new nuclear reactor for you. Not to question the expertise of the nuclear engineers in China, but it is truly bizarre that the UK, mercilessly leached off by the USA for nuclear tech. cannot now make its own power-generating reactor. Since the big earthquake, plants here are shut down, what a waste. The fuel (metal) has a half-life. Sure, once it has been dug up and refined, it is burnt in nuclear fire, the remnants are extremely toxic and carcinogenic. Nobody is thinking about the more efficient fuel-cycles that lead to mainly non-radioctive residues. At least in Europe, from my reading, the more waste-making techniques are compulsory. Absolutely. The UK Government's annual expenditure runs north of £500Bn. No problem whatsoever punting a couple of million at blue sky projects "because we can and it's awesome" when such projects offer international bragging rights and serve a reasonable educational purpose (e.g. Bloodhound were at Goodwood FOS this year with the REME doing lots of engineering stuff with the kids, not to mention all their outreach work to schools, etc). How much NOx will be emitted? And would it have to pay the 'Congestion Charge'? All very well, but . . .
How did it do in the emissions test? Re: All very well, but . . .
Can't really say, as the rocket engines burnt the test equipment. Probably quite badly. I work it out to be about 0.0315 mpg at 1000 mph probably about 0.00945 mpg when the rocket kicks in at 300 mph. So 693498 g/km CO2 in the real world. or 208049g/km CO2 if you are VW. Sunday 27th September 2015 10:14 GMT Sorry that handle is already taken. Probably pretty well on NOx though! Two comments 'rejected' in several years, both by Orlowski on his recent daft PETA Monkey Selfie item. It's got indicators, could be dangerous if someone comes up behind you at 1000mph and doesn't indicate to pull out. As to the "emissions" question, above, who the hell cares? It's one, single, solitary vehicle in an awfully large world. Were you also worried about the Space Shuttle poking holes in the atmosphere? Do you have issues with "contrails"? Get over it, and learn some science. Whoa there! Steady on tiger. Re: As to the "emissions" question, above, who the hell cares? It's a joke about the current VW scandal. Although the original post was clearly tongue-in-cheek, I bet there are millions of ecoloons out there asking exactly this question. Relax - it's got the lowest tailpipe emissions of any 1000mph car on the market. "Do you have issues with "contrails"? " I do actually. In the southeast a clear blue summer sky is almost unheard of these days. Its almost always a hazy mess. And while the contrains might just be water vapour there's as much CO2 up there released by the aircraft (not to mention a lot of NOx) that you can't see. PBS Nova said that contrails provide much-needed global cooling. If true, then leave aircraft alone until everything else is done. There are many good things about this. It's a technological tour de force, it can inspire all kids, and not just boys, to get into engineering, it's pushing boundaries. And I love that it uses a supercharged Jag engine as a fuel pump. But it is still at heart an exercise in stopping a wingless plane from taking off. Which is an engineering challenge in itself, and something very non-trivial in all speed record attempts (just ask Donald Campbell). As are the other little tasks like ensuring the wheels are strong enough that they basically don't just shred themselves given the velocities and forces involved with rotating at such high speeds. And also being able to brake the thing, given that there are various systems needed depending on the speed when they are applied. It's been interesting to read the ongoing coverage of the project on the various BBC website updates, covering all these little tasks and to hear Andy Green's view on them given he's going to be the one along for the ride. If we could ask Donald Campbell, it wouldn't be half as challenging as you're making out. A major issue is the sonic boom from the nosecone digging up the ground infront of the vehicle. When you get that low and fast all sorts of weird things start happening! "It's unlikely we'll see much return from all this" - WHAT? El Reg, you clearly live on a different planet to the rest of us. This project is invaluable. It boosts interest in STEM subjects in schools. It boosts interest in STEM jobs in industry. It boosts investment in STEM companies. That's what this project is about. That we get to hold on to a world record is just a bonus. Re: "It's unlikely we'll see much return from all this" - WHAT? Measurable return. Indirect return is very hard to gauge. Do they know anything about science...? "Do they know anything about science...?" Well judging by the fact that Corbyn has just selected a Vegan as his Shadow Minister for Farming and Rural Affairs, we can surmise that if he wins the 2020 election, his science team will be comprised of people with doctorates in Homeopathy. Measurable return? How about the statistics that show a distinct uptake in STEM subjects after Thrust SSC was in the same position? How about the statistics that show a distinct uptake in STEM subjects after the Apollo programme? Is that measurable enough? No? Really? "It boosts interest in STEM subjects in schools"
Richard Noble's been all over the country with Bloodhound SSC. The man is run off his feet... that your son's school has not been visited might just be a case of 'we've not been there yet'... Have a word with the BH team. and I really hope it inspires another generation of kids to be engineers, but I do think that using a jet engine to get a land speed record is cheating a teensy bit. Not to detract from this amazing supersonic ground-effect aircraft, but shouldn't we require that such record contenders get most of their speed through driven wheels? >What it is, looking at the layout, is the fastest Reliant Robin in the world. Bloodhound does have four wheels. Ah. Post deleted. I hide in corner. What it is, looking at the layout, is the fastest Reliant Robin in the world. So, is Jeremy Clarkson already working on that one? The advantage of jet propulsion is that it won't matter much whether it's tipped over or not. In that case why not lock it onto rails? "In that case why not lock it onto rails?" Because then it would be the world's fastest rail locomotive, not the fastest car. We had an evening talk about the project only a few weeks ago, given by one of their senior PR bods. It was a very interesting hour or so, and better than half filled the local theatre (I'd guess about 400 people came to see the talk). > In that case why not lock it onto rails? That was covered, and he said there is in fact a rule book for this. There aren't that many rules, but it must have 4 wheels, and it cannot be on rails. The other detail is that it must make a run one way, turn around, and complete a run the other way within one hours of passing the start gate on the first run. That means, after the first run, the car has to stop, and they have to reload everything - new parachute, new rocket, refuel the jet and fuel pump, etc. One thing the driver has to do is watch the speed as it's really deceptive - remember James May saying he almost opened the door while still doing 70mph after his max-speed attempt in the Maybach ? Yeah, don't try doing the U-turn at the end while still doing 200mph+ ! They may also have to inspect the wheels, as they haven't run the car at speed yet, they don't know how much damage will be inflicted by the tiny stones when hit by a solid aluminium wheel doing 1000mph. As an aside, they reckon the project has brought big benefits to the area where they are testing - forget where it is now. The government there has built a road (on the "if we get round to it" list, but actually done to get the project there) which has improved transport links to the area. The water system got upgraded (again on the "if we get round to it list) - so the locals now get piped water rather than relying on the wells they used to have to use. And hundreds (or even thousands) have been employed by the government to "pick stones" for several years - clearing an area the equivalent of a motorway from London to Moscow IIRC ! On the latter, big deal you might say. But it's given employment (well paid by local standards) to many, and thus boosted the local business infrastructure. The only reservation I have is, what happens when they've finished and the work is gone ? "... but I do think that using a jet engine to get a land speed record is cheating a ..."
<pendant>From the article it seems that the jet engine doesn't even take it up to the Bluebird land-speed record. Hopefully that was intended to be ironic. "Hopefully that was intended to be ironic." It's an Internet meme extensively milked on TDWTF. Pendant, pendantic = related to hanging. You may wish to set aside a few hours. Lots of problems, engineering, solutions and pictures from one of the team. It was ace, had Recaros and some serious Pioneer ICE. They're lucky I drove it into a tree in 1991 and killed it or they'd have been worried about the competition. I'm glad that it was only the Nova that bought it when you hit that tree...! £20m (estimated) for the car vs. ~ £1M per MP (880 MP/mile* end-to-end approx) = £880M saved by "squishing" them. * ave MP 6ft ~ 72 inches, 63360 inches in a mile = 63360/72 = 880. 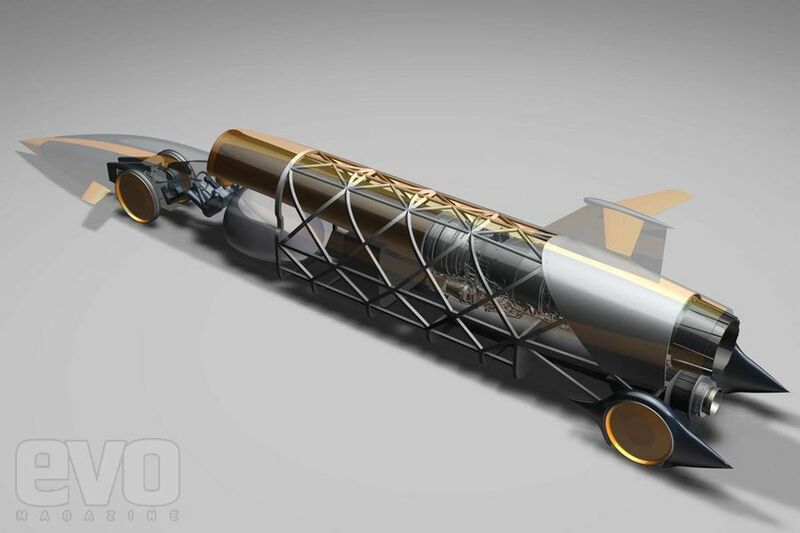 £20 million comes from google search of "how much does Bloodhound ssc car cost ?" "If we can pave its route with politicians, I can see an excellent return on investment"
Now why on Earth would you want the route paved with the slipperiest thing known to man? It's a car, not a sleigh! If I only I could choose between contributing to Thrust SSC and paying MPs salaries. I for one know which is of more value to the country! The Fairey Delta 2 was the first aircraft to exceed 1,000 mph. Increasing the record by about 300 mph to 1,100 mph. At that speed, you are moving faster than the sun across the sky. So good luck to those prepared to challenge Hyperion's chariot while keeping wheels on the ground. But a Bloodhound was reputed to go supersonic within 2 body lengths after rocket booster ignition. Cruise, a mere Mach 2.7, was maintained with jet engines of a slightly simpler design. Not bad for 1957! Low mileage, good runner, only one owner (trembling), slight brownish stain on driver seat. Handy for quick nips to the local takeaway or doing the school run, low insurance group. Emissions test passer and current MOT. Any reasonable offers entertained, no time wasters please. of meeting an engineer on this at a party a few weeks ago - also was an ex-F1 engineer. Showed us a camera phone video of the completed car a bit in advance of the launch. Hadn't been paid in two months - money is very short....Noble is one of those people you either love or hate, which makes fund raising either easy or very hard. Engineer was a very interesting chap! that the de-industrialised UK (oh no, they make these little pretences, like spending a fortune on US nukes that are, according to believable rumour, also controlled by US keys, ho, ho,'independent deterrent) manages to make a supersonic dragster. The required preparation for the dragster run is interesting, removing all features from a landscape that is all but, but not entirely. featureless in the first place. Still, people are paid (poorly) to do that. The high desert in South America may have been better, but with the lithium mining, maybe not now. I wish the driver and team well, but something like this has litle to do with anything real, even in the nation of origin. As far as I can see from afar, UK elites are law and arts graduates. They sneer at people with technical nous. I was surprised to see that a British engineer-architect designed many of our classic railway buildings, of course, few remain, but I am touched by seeing one that is semi-preserved and the national treasure, one near the western coast, the ruin, but very beautiful. "The 550bhp Jaguar Supercharged V8 engine....will power the rocket oxidizer pump..."
My favorite spec from the Apollo's Saturn V rocket is "55,000 horsepower". Not the engine, just the pumps. Each. There are 5 of them. 275,000 horsepower, just the fuel/oxidizer pumps. and I *still* had a white Transit sat an inch from my back bumper, flashing me to get out of its way..
Appropriately given it's name, to my mind it doesn't look too dissimilar to 1/4 of a bloodhound missile with those parts slightly rearranged. Tell me again why so much time, expertise and money is being spent on this and not some worthier project that might improve the world? Or am I just an old tree-hugger? Because this project will improve the world.